Everton's Wayne Rooney (C) applauds at the final whistle after their UEFA Europa League group stage match against Apollon Limassol, at Goodison Park in Liverpool, on September 28, 2017. PARIS - Under-fire Everton will hope to kickstart their campaign when they play host to Lyon on Thursday looking for a first win in the Europa League group stage. "We just need to get results and once we do that, the confidence will come back into the team and things will come a little bit easier for us," £45 million ($58 million) summer signing Gylfi Sigurdsson told the club's website. Among the others are Nice and Lazio, who meet each in the south of France with the French outfit looking to overcome Italian opposition -- something they failed to do when they lost to Napoli in the Champions League play-offs. On Thursday his side welcome Athletic Bilbao, the 2012 Europa League runners-up, to their compact Jämtkraft Arena, more than 500 kilometres north of the Swedish capital Stockholm. 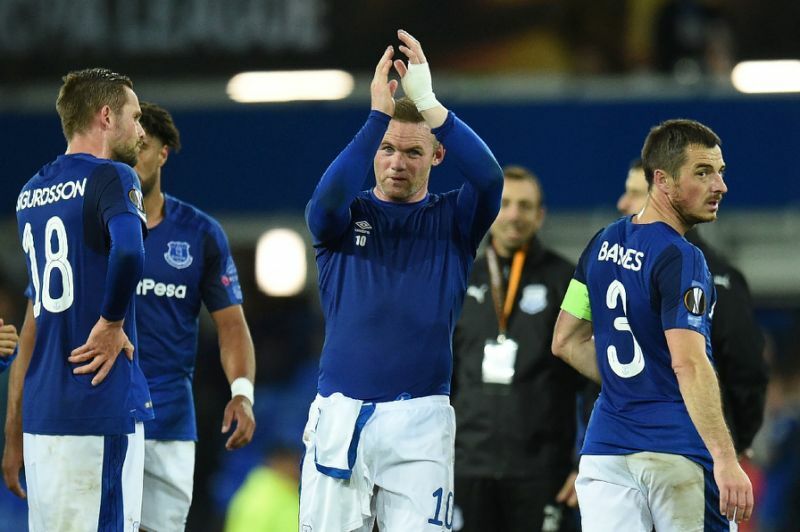 Under-fire Everton will hope to kickstart their campaign when they play host to Lyon on Thursday looking for a first win in the Europa League group stage. The Premier League side have just one point from their opening two matches in Group E, following up a comprehensive 3-0 loss to Atalanta in Italy by drawing 2-2 at home to the Cypriots Apollon Limassol last month.